Staying with the scary theme for another day, with Stephen King’s The Tommyknockers. The announcer calls it supernatural, but my recollection of the book was that it was science fiction. I could be wrong though. I’ll be annoyed if this is only the first few episodes, though, as this appears to be the only tape I have in the collection with this programme on it. After what looks like a dream sequence opening, with Jimmy Smits running through the woods, and a woman with green eyes, it settles into familiar Stephen King territory – a small town where nothing interesting happens. EG Marshall is a doting grandfather, telling his gradson about the place in the woods where real magic happens. 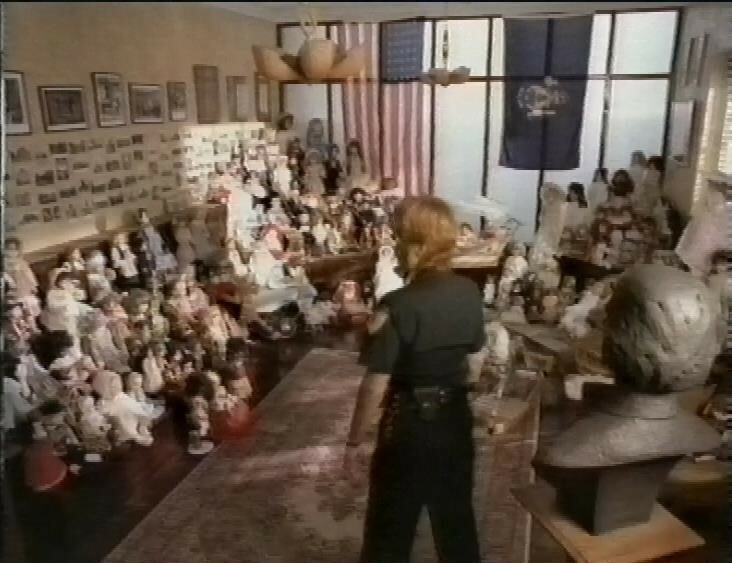 The local Sheriff (Joanna Cassidy) has an office filled with dolls from all over the world. Creepy dolls which scare small children, and which she talks to. 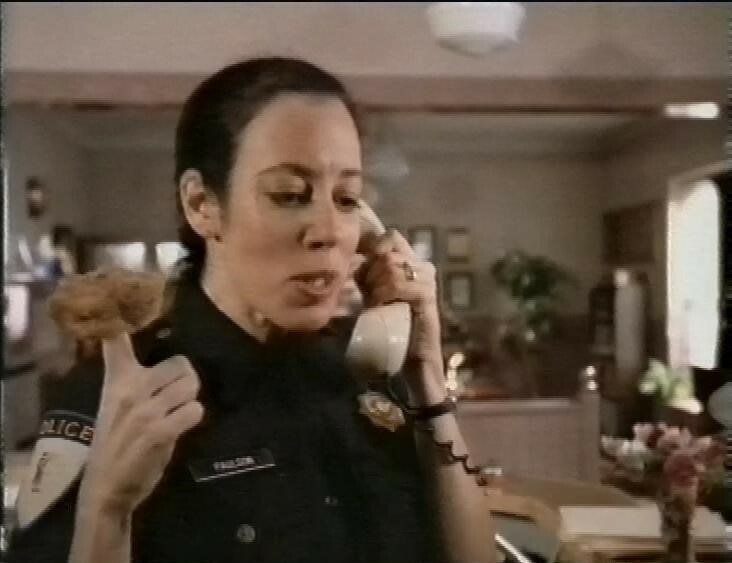 Allyce Beasley (Agnes DiPesto from Moonlighting) is a deputy. Look, she’s even eating a doughnut. She’s married to Cliff DeYoung (Brad Majors from the Rocky Horror sequel Shock Treatment). But he’s having an affair with the new postmistress, played by Traci Lords. Marg Helgenberger is a writer (still using a typewriter!) and she takes her dog for a walk, when she finds a strange metal object buried in the ground, which zaps her dog with a green spark. 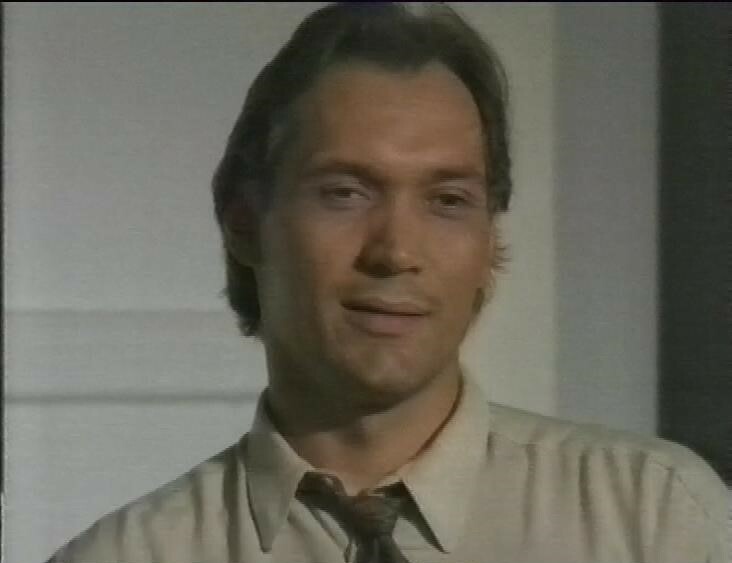 We meet Jimmy Smits for real, as he attends an AA meeting, because he’s a recovering alcoholic. 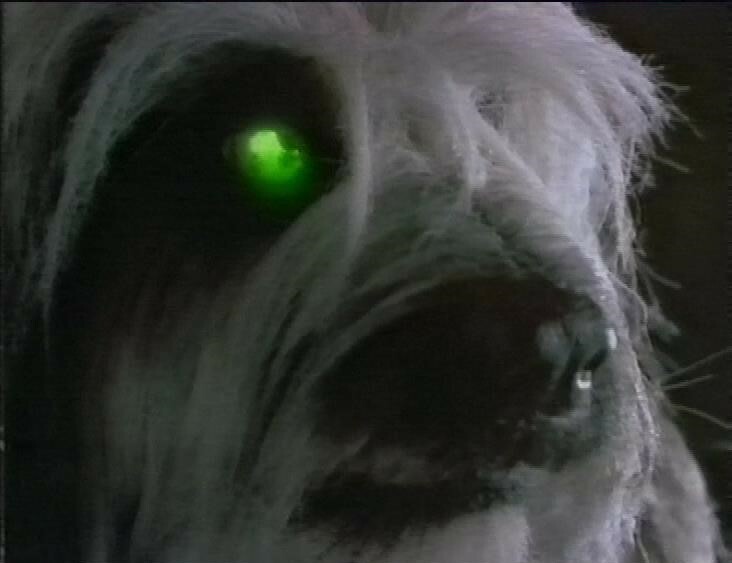 The dog who was zapped starts going a bit green-eyed during a storm. It looks like they had to build a fake dog head to get that glowing effect. Surely a digital effect would have been possible (and cheap)? This was made in 1993. Marg notices the change in the eye – it looks like her dog’s cataracts have receded. Smits is a poet, invited to read some of his poetry at an event for new poetry, but he reads an old poem. His host is very rude to him, and suggests it’s because he hasn’t written anything new recently. We also learn he has a metal plate in his head. He starts to drink at the reception for the event, behaves boorishly, and wakes up with no recollection of what he might have done, then he hitches a ride home. 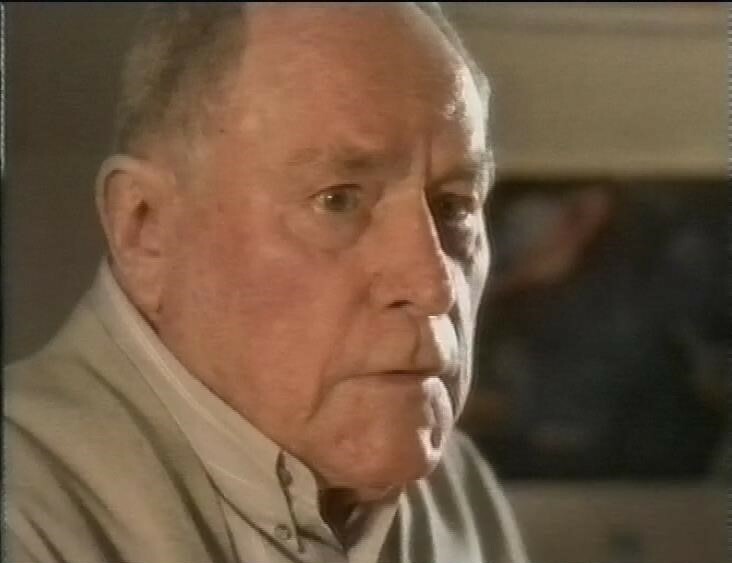 When he arrives back, Helgenberger (they are a couple) excitedly tells him of her discovery. She’s now dug up more of the buried object, and it’s all green and glowy. Green and glowy seems to be the dominant theme of this programme. Pretty soon, everyone in the town is exhibiting strange abilities. Helgenberger fixes her plumbing. The postmostress invents a magic machine that sorts the mail. Allyce Beasley can talk to her television, and it advises her to kill her unfaithful husband, and Helgenberger can read minds. Rather more problematically, the young boy who’s learning magic tricks invents a trick that makes his brother disappear, but he doesn’t know how to get him back. 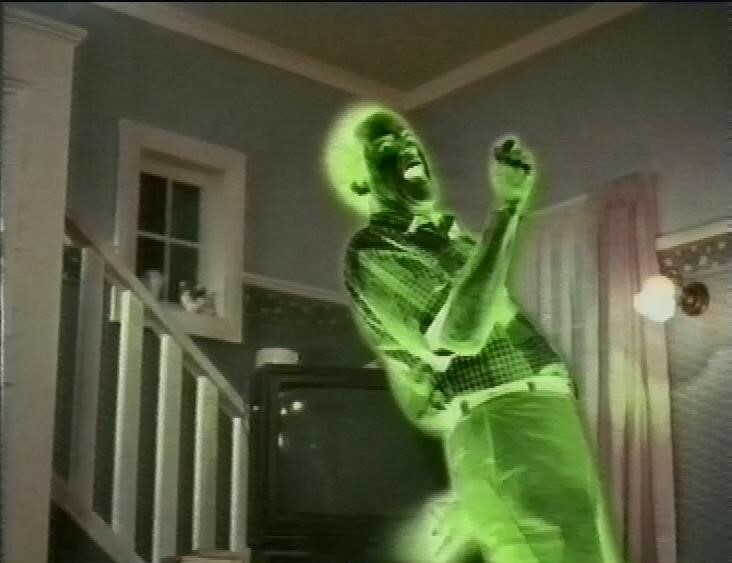 Beasley rewires her TV so that it electrocutes unfaithful hubby Cliff DeYoung (in a green and glowy way, of course). In part 2, the townspeople are mostly possessed by whatever is living in the buried ship. The Sheriff from the nearby town is killed by a killer vending machine. 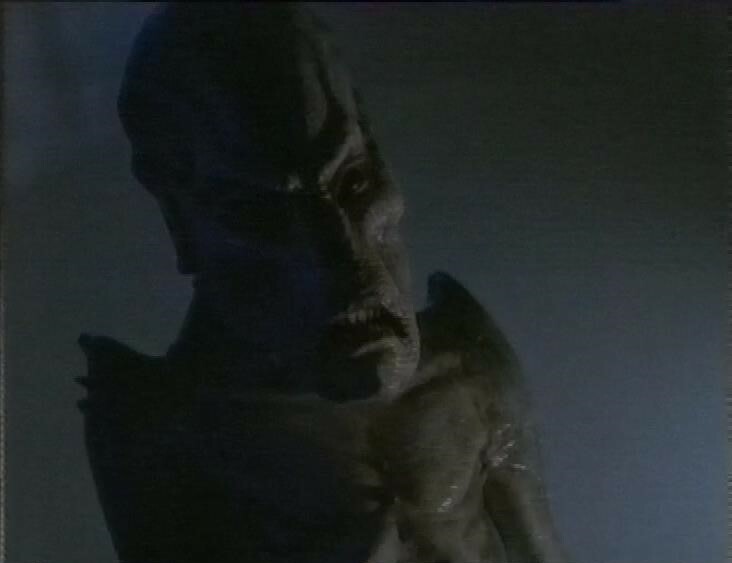 Smits and Helgenberger find their way onto the Tommyknockers’ ship, find the missing boy being used to power it, and also come face to face with one of them.